A restaurant I remember with great fondness. Here is fine dining with all the pretense stripped out. The front of house is the back of house, with chefs serving you – and they’re always knowledgeable about every dish that they serve. Chefs Joshua and Michael were really friendly, and made me feel at home. The pulsating rap made each table anonymous, in their own drunken revels – this place is BYOB. I enjoyed the casual fine-dining vibe here, carpeted floors and clawed chairs always make me feel a bit uncomfortable and stiff. 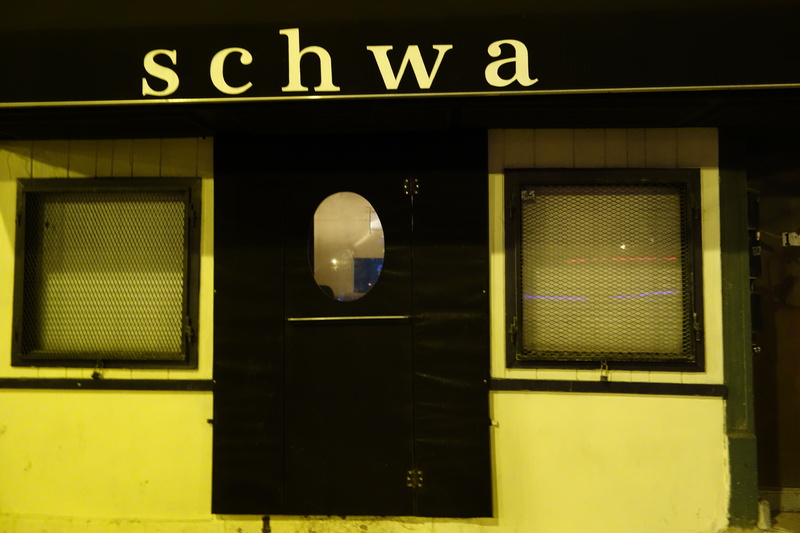 Set in a corner of Ashland Avenue that’s almost industrial wasteland, it’s easy to walk past Schwa. The “dining room”, if you want to call it that, is an orange-lit space that’s maybe 80 square meters in area. I knew all of this before I came to Schwa – the only criterion I would use to call my meal a success would be the food they would serve. From the packed dining room (and Schwa is notoriously difficult to get a reservation at), I would say a lot of diners agree – creature comforts are secondary to the food. And what a meal I had. A tip for getting a reservation: I called around 1pm. Most people claim they have success from 12-4pm. The key is, if the dial-tone goes straight to the message that “the mailbox hasn’t been set-up” instead of ringing about 5 times first, that means someone is on the line. Spam your calls then. Recreation of a typical movie experience in America – nachos, pizza, gummies, and popcorn, except deconstructed – and remade. Tells of their playful nature. Flavors were remarkably accurate. 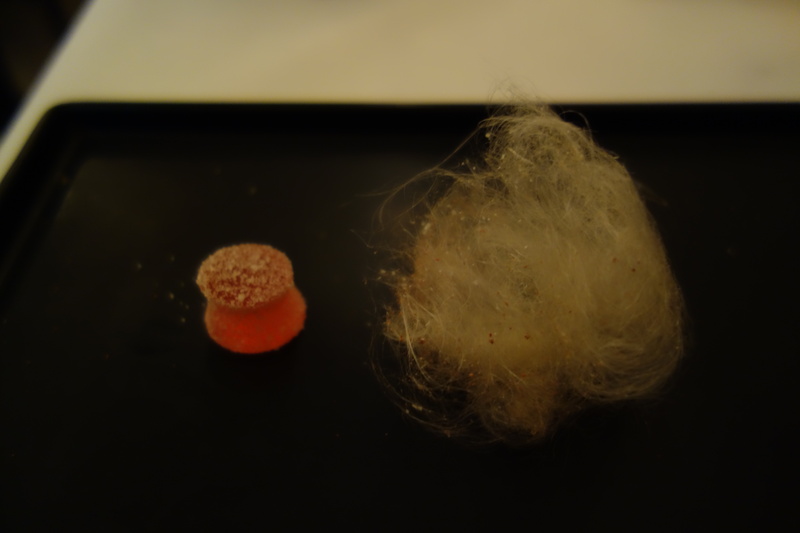 Gummy was indistinguishable from the real thing, candy floss (another movie food) was well-seasoned with pizza flavor, soda tasted of that buttery popcorn taste, and the nachos were good. This was a more experimental dish. I remember the jelly having great flavour, which I originally thought was due to curry, but Josh said it was squash and cantaloupe. 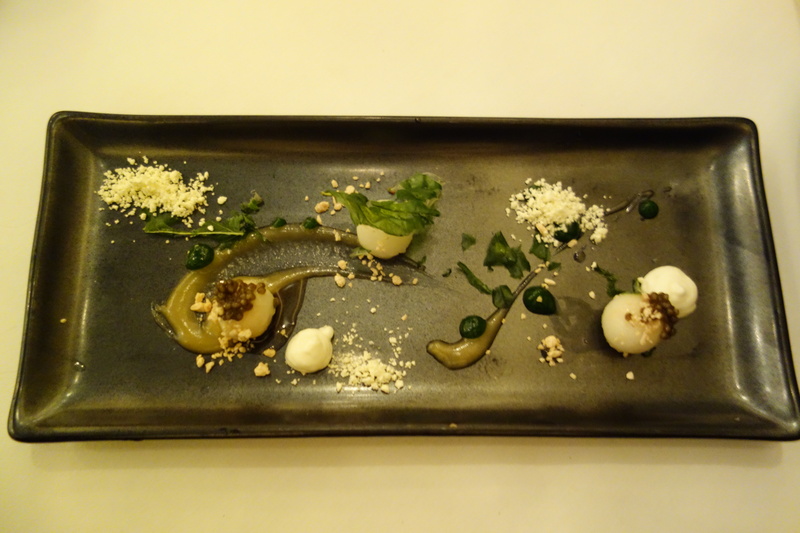 I have on my tasting notes “fruity taste of christmas pudding” somewhere on this dish. 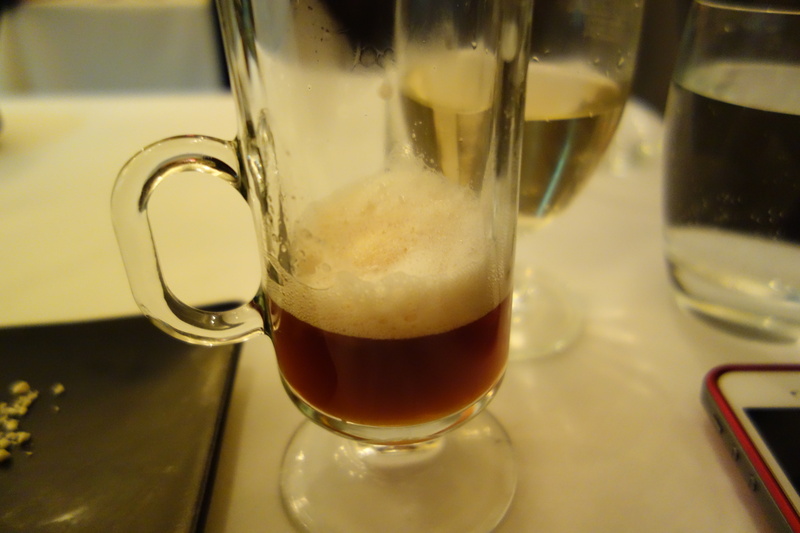 A schwa signature, this was served with no spoons. Picking it up with my fingers and downing it in one bite, a rich and luxuriant cream sauce was really delicious. I can see why this is an ever-green on the menu. 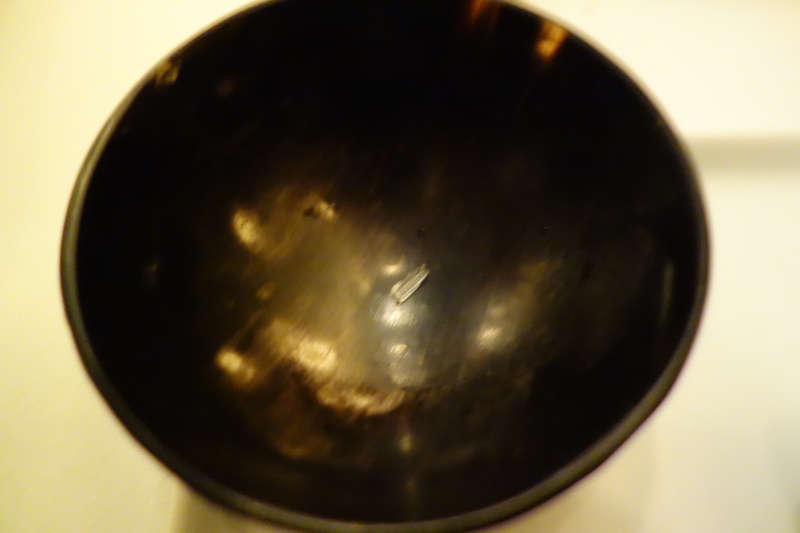 It says as much about Schwa as it does about me, that I had no qualms greedily tipping the small bowl over my lips to get every lick of that sauce. 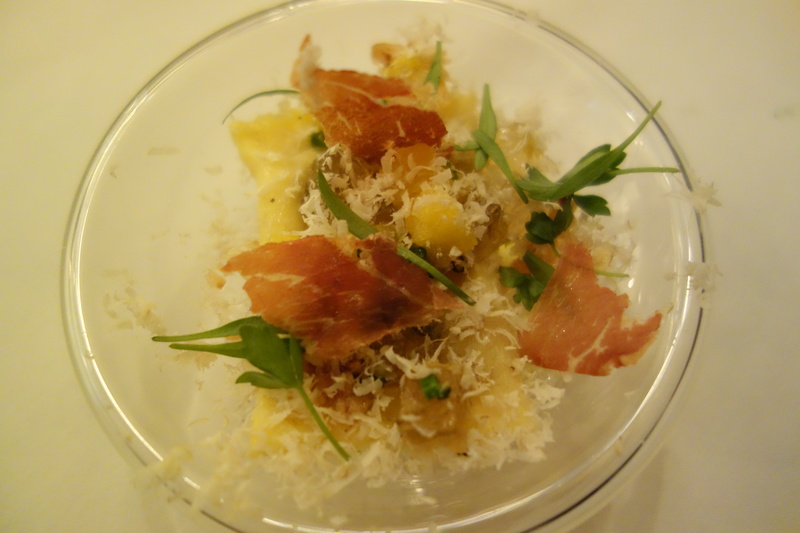 Agnolotti means little purses in Italian – and they held sweet chestnut puree. 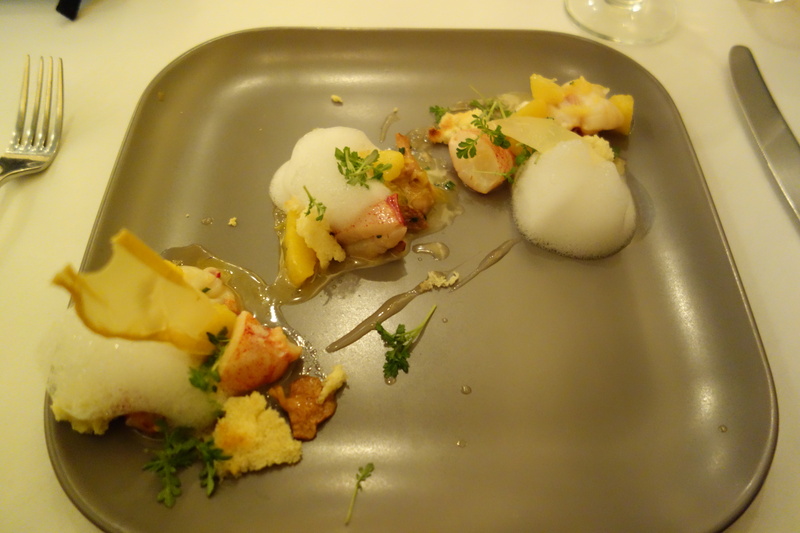 I was not the greatest fan of this dish, since I felt this was one of the rare times the flavor combinations were slightly off – the sweetness of chestnut + other two types of sweet gelatin cubes marginally overpowered the ham preparation. Carbonated pear balls? Why not indeed! 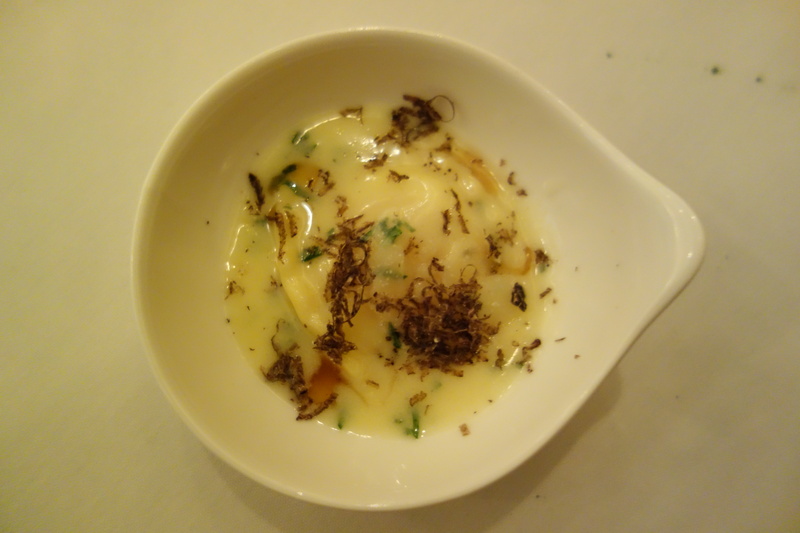 It was an odd combination, caviar and carbonated pear, but the white chocolate harmonised the dish with its fat content; and the textural contrast of basil crisps balanced it. 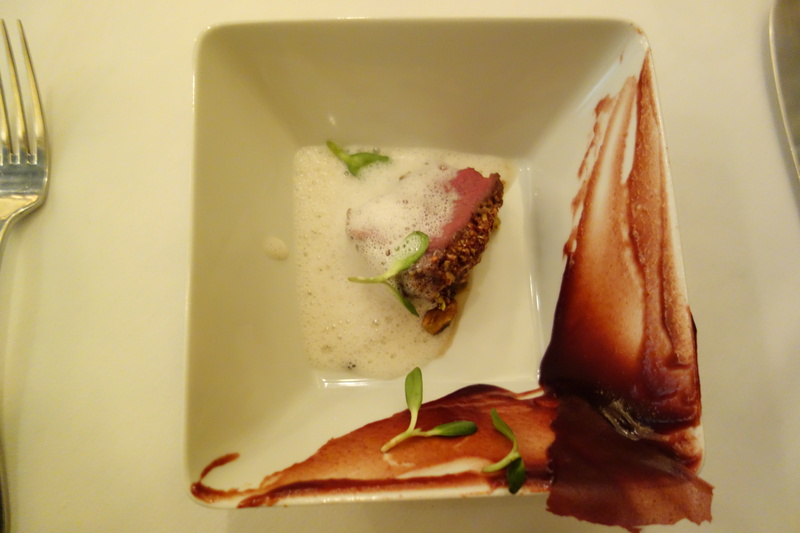 But the combination wasn’t as enlightening as the following two dishes. Afterwards I found out from my copy of Modernist Cuisine how to carbonate fruits. See below*. 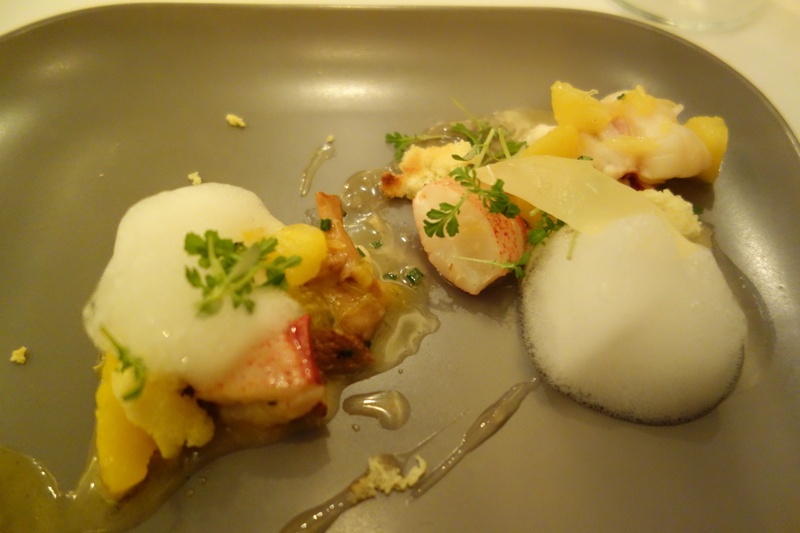 The conventional pairing of lobster would be with a citrus/mango sauce to provide fruity contrast. 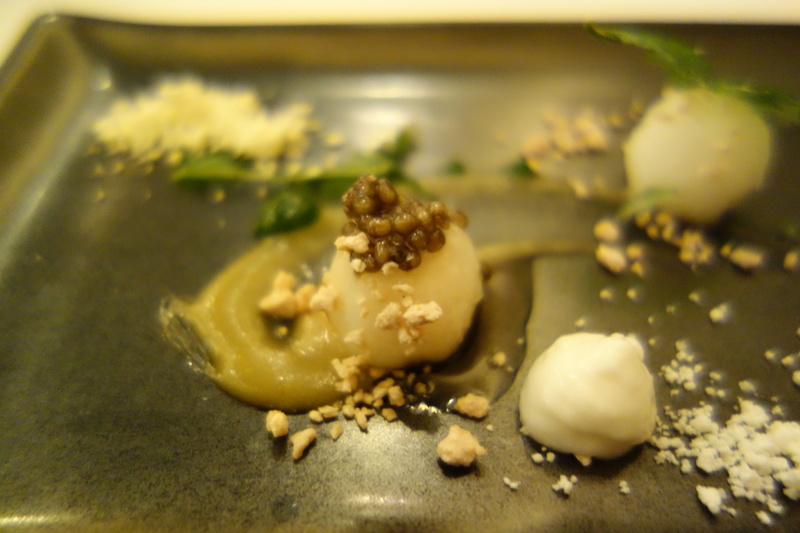 But I believe Schwa has provided a playbook to elevating those flavors. The secret is earl grey tea gel, which has the herbal taste that really triangulates between the rich chewiness of lobster and a baseline sweet fruit flavor. A dish of genius. This dish worked on at least two different ways. 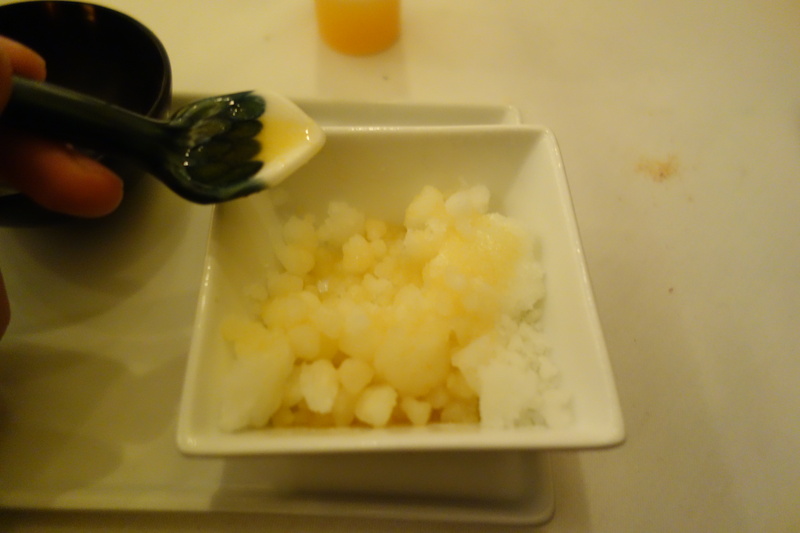 At the centerpiece is the thumb-sized hard slab of apple-ice. 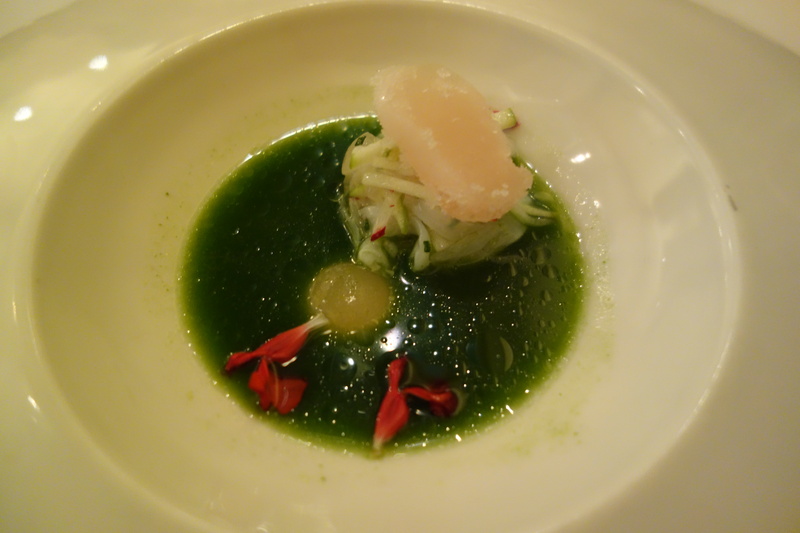 First, it brought out the smooth cucumber and fennel taste from the salty, pungent and oily herbal broth. Second, the cut, marinated cuttlefish and finger lime was seasoned in a way to remind me of Thai papaya salad, Here apple ice was a sucking lozenge, its cool hard sweet apple flavor cutting through the Thai-papaya-style seasoning. Another great dish. 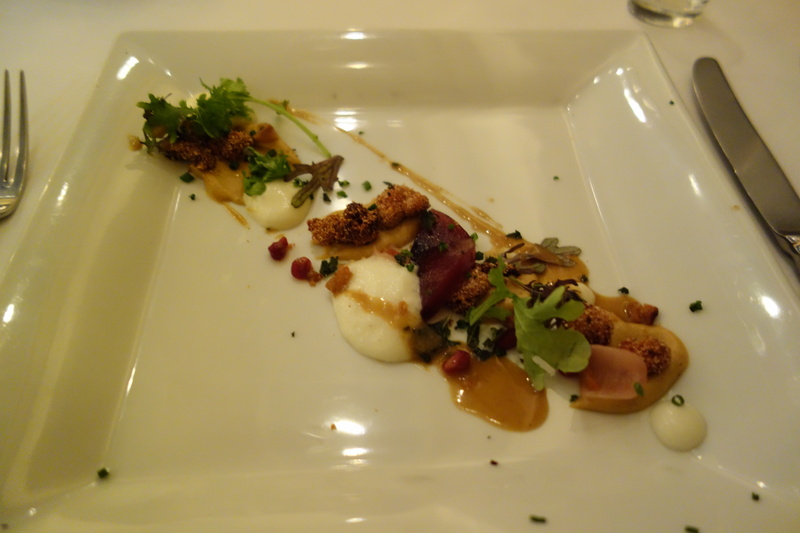 Pleasant, the sweetbreads were expertly (diced and) fried. 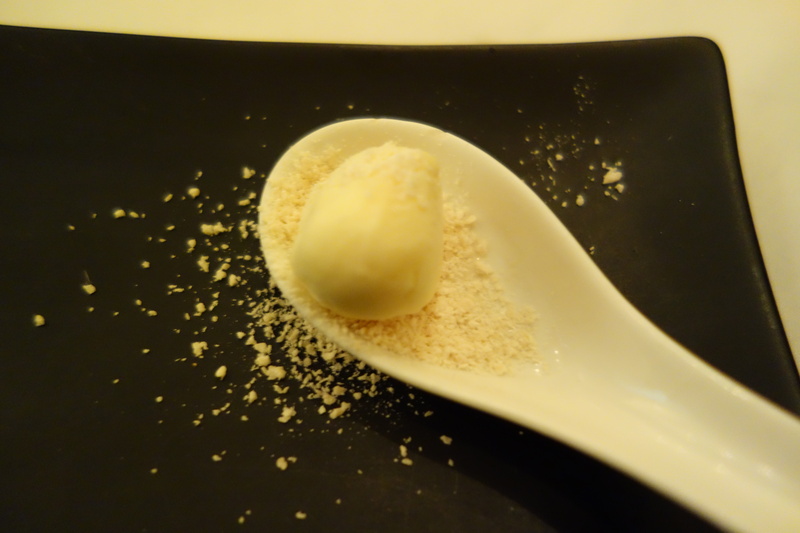 The foie gras +sweetbread sauce had a nutty taste like peanut. 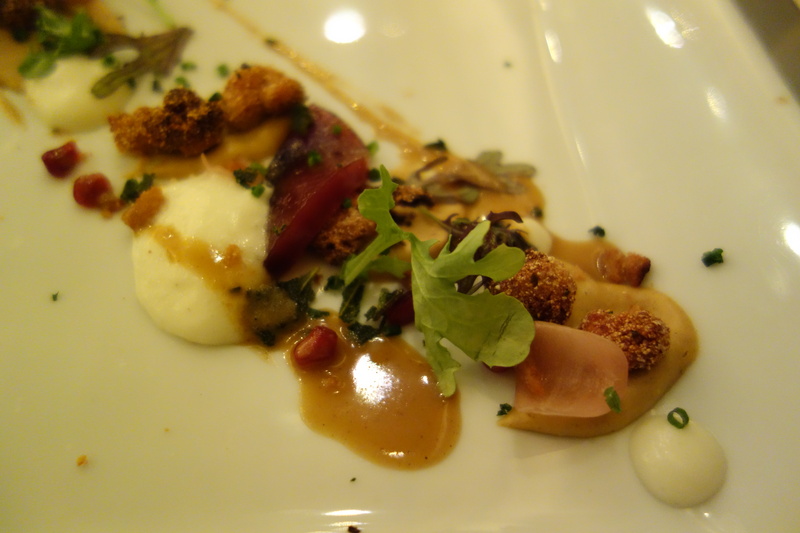 I may have had a greater reaction to this dish if I had had more experience eating Thanksgiving dinners. The first time I’ve had antelope ever, I think. Michael explained that it was shot from a helicopter by a sniper in Broken Arrow Reserve in Texas 2 days ago. Due to the vigor of the antelope, if it is shot from any closer, the stressed out antelope would presumably attempt to flee, and in its stressed death would go into rigor immediately, making the meat completely unpalatable, hard and dry. This meat was served rare, and what a cut of meat – it was so soft, that it was pliable to the butterknife I was cutting it with (the kitchen gave us a butterknife for that reason presumably). 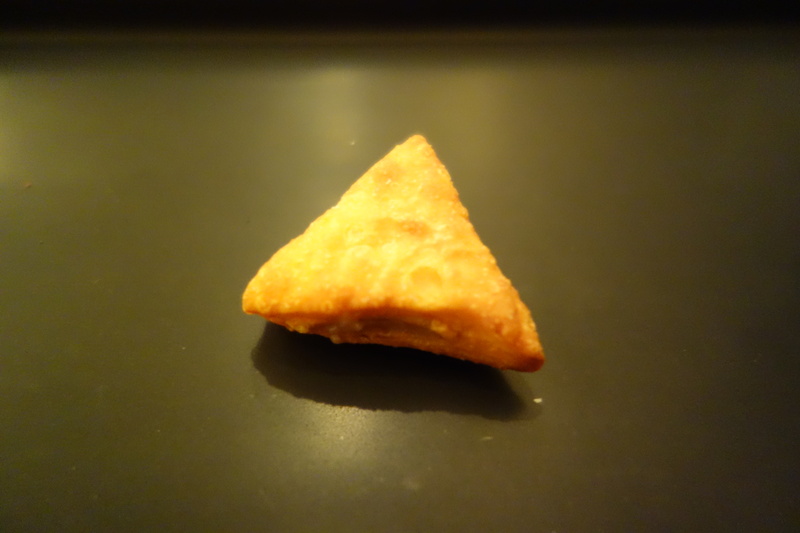 The rest of the accompaniments were secondary – besides being a passable trail mix. I guess I had my first taste of ultra-high-density fast-twitch-reaction-fibre meat! Amazing. 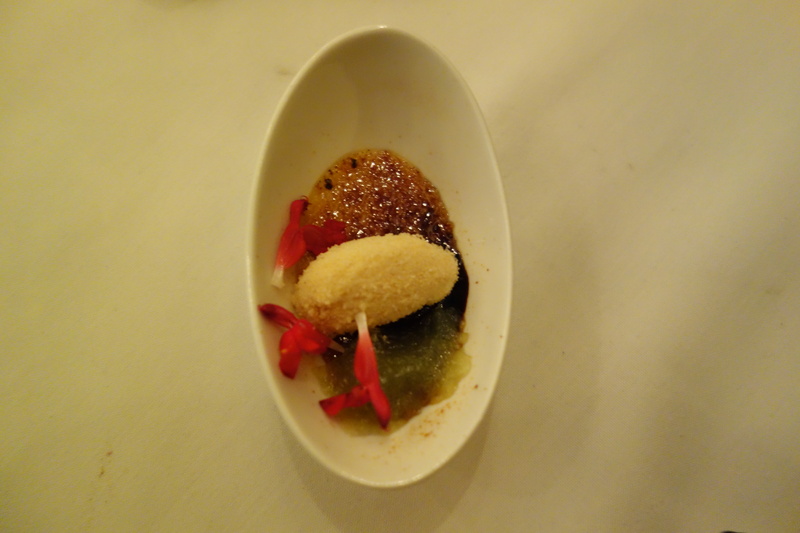 Chimay cheese below was treated with a creme brulee crust above (how did they do it? 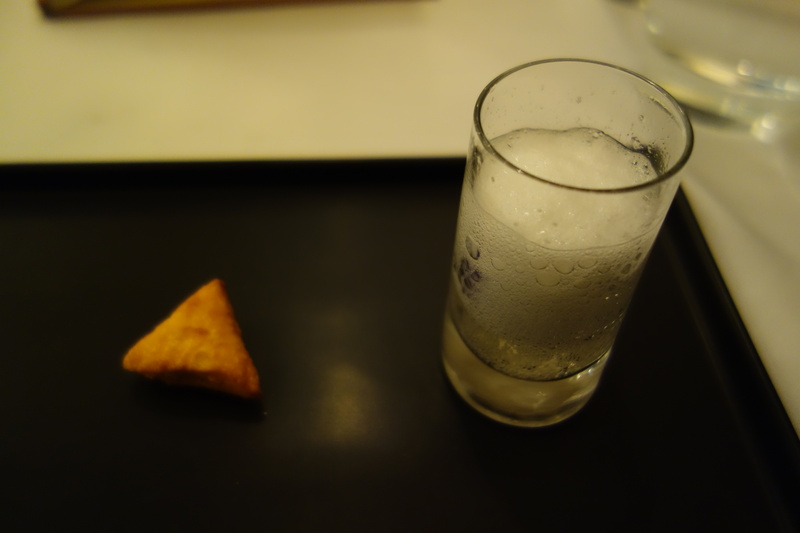 ), and the funky taste of good bread came from the yeast ice cream. 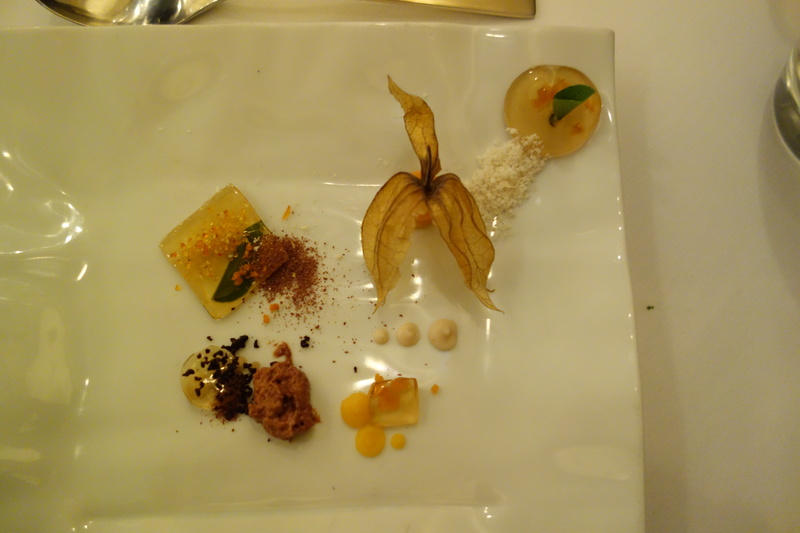 Ostensibly a cheese course, this was a great tribute to beer. Rounded. Completely unique. I miss it already. Another amazingly balanced dish. The clean taste of parsnip was an inspired choice to be dumped into root beer – and a whole spoon of butterscotch. I wish I had had a whole mug of this! I am haunted by the taste of that honeycomb brittle. Salty, sweet, with a lightly burnt taste. 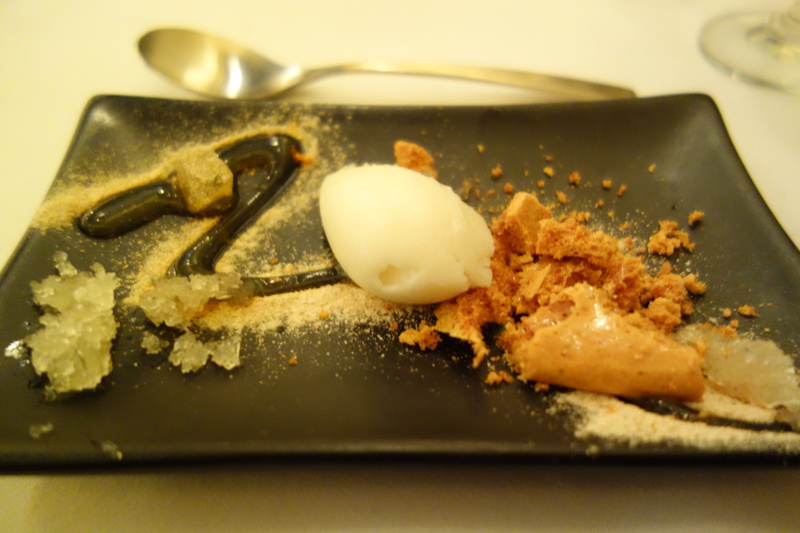 The thought occurs to me that if I came to Schwa every month for dessert, I would be a very happy man. The desserts have been absolutely outstanding, zany and off-the-wall, while remaining perfectly balanced and very pleasant. A common sight in the winter months everywhere is yellow snow (I.e. 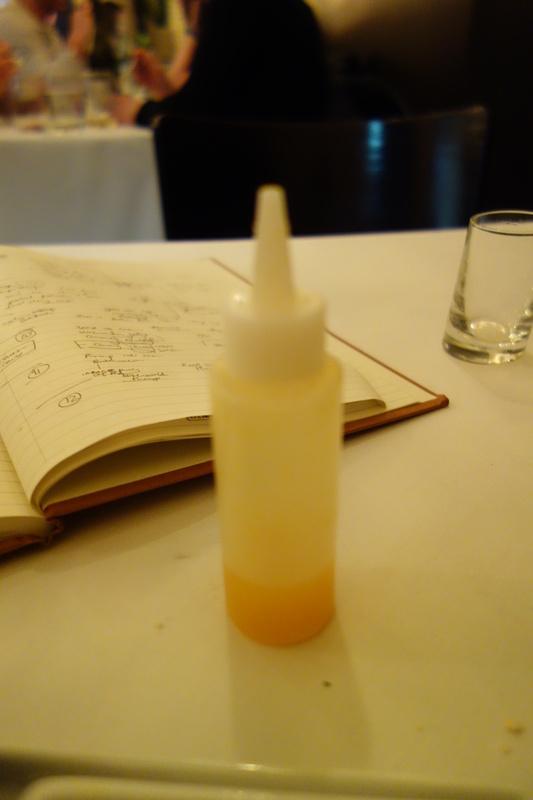 dog piss) I am glad to report this tasted considerably better than that! 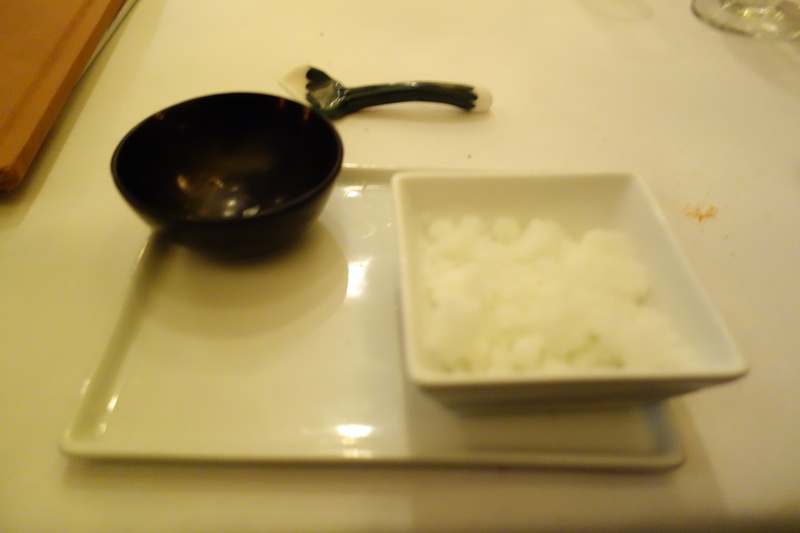 This was more of an effect dish – the crystal once popped in the mouth became menthol, and a rush of cold air killed my taste buds, and then shoving saucy snow into my mouth heightened the menthol taste. One of the oldest effects known to me (menthol + cold == more cold), this was evocative of the harsh Chicago winter I was about to step out into shortly. A. If you put fruit in a pressure chamber with carbon dioxide, the gas will permeate the skin and dissolve into the juice inside – Modernist Cuisine. vol2 p469.